The once dodgy Californian city of Oakland is experiencing a resurgence, drawing the Bay Area’s creative crowd with its burgeoning food, nightlife and arts scene. Set in an Art Deco building formerly used as a flower depot is Duende, an innovative space for gastronomy, art and live music. 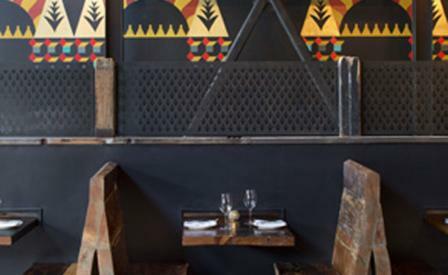 With its nearly untranslatable Spanish name referring to a goblin or magical spirit, Duende seats up to 84 guests on the ground floor, a vaulted-ceilinged room featuring an eclectic mix of salvaged wood, exposed brick, distressed stucco and oxidized steel. From the open kitchen, chef Paul Canales serves up Basque-inspired pintxos. A wine bodega allows guests to grab a favourite bottle on their way out - but before doing so, they can take an iron staircase up to the second floor, where a black and gold-emblazoned grand piano sets the tone on the live-music stage. The venue was designed by Oakland-based Arcsine Architecture in collaboration with local artists like Sam Strand and Peter St. Lawrence.